Felt Unicorn Pattern - This pretty pastel unicorn toy or pillow is cut and stitched entirely by hand (no sewing machine needed) and is the perfect sewing pattern for beginners and children. 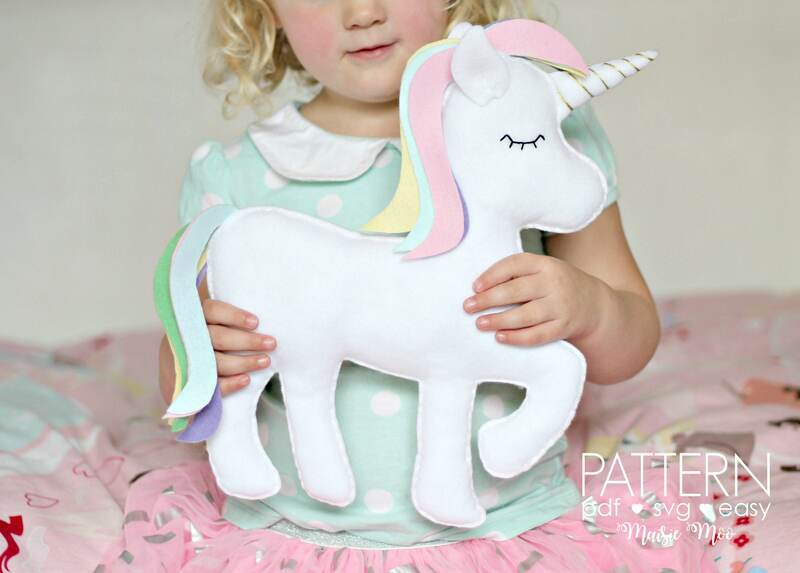 This larger sized unicorn pattern is now available at part of the hugely popular Felt Unicorn Pattern - you will receive both small and large pattern sizes to make at home. All measurements are in both metric and imperial (cms and inches). All supplies referenced are available in craft or fabric shops the world over. As a native English speaker, my patterns are all clear and concise, easy to understand. - Comprehensive PDF Pattern E-Book Tutorial - includes materials list, step by step photos and instructions as well as ideas on how to use your finished creation. - Maisie Moo Sewing Guide - all you need to know about felt, stitches and the tools used in your pattern. As a beginner, I would allow 2-3 hours to sew this creation (this includes reading through your pattern, cutting and stitching). Please note this is an approximate, as sewing time is very dependent on your sewing skills. Your pattern will include a more detailed list of required materials. In most instances you are welcome to sell the final product (however I ask not on ETSY). Please scroll down to 'Frequently Asked Questions' for more detailed information on selling creations made from a Maisie Moo Pattern. Original design by Ria Crawford for Maisie Moo Felt Creations. Resale and mass-production of pattern is strictly prohibited. Payment method by paypal and direct store checkout. Taxes paid locally will automatically be added to your listing total on checkout. No Refund policy on patterns. Return Policy on physical items: I want you to be delighted with your purchase. If, for any reason, you are unhappy, please contact me first and I will work with you to resolve any issues. If we can't figure out a resolution, I will refund your full purchase price, not including shipping fees, upon return of the item in its original condition. Items created from a Maisie Moo Pattern can be sold anywhere EXCEPT on ETSY. - Item is handmade by the person who purchased the Maisie Moo pattern. - The item cannot be mass produced. I so appreciate positive feedback on my site, and thank you in advance for taking the time to click there. I love the pattern but want it in a different size? I understand that everyone's needs are different, so all patterns include a easy to follow 'How To' guide for resizing patterns at the printing stage (using Adobe Acrobat Free Version). So if you want to make my unicorn into a cushion, you can! I would like to sell my creations, what are the rules? How can I receive sale referals for creations I have made from a Maisie Moo Pattern? I frequently get asked if I can make my patterns and in most cases the answer is no. I do however advise any enquirers to search on Facebook and Instagram for hashtag #maisiemoopattern .... so if you would like your creations to be considered, just add my hashtag to any photos or listings and potential customers will find your work... easy! I have a Cricut or Sillouette, can I use a Maisie Moo pattern in my cutting machine? It will be stated on the pattern if an SVG is included. Please note that not all patterns are suitable for cutting machines. The size of your pattern pieces can vary dependant on how and what programme you use to open your file. There are some small pieces that may or maynot suit your cutting machine. Please check sizing to the PDF pattern before cutting.